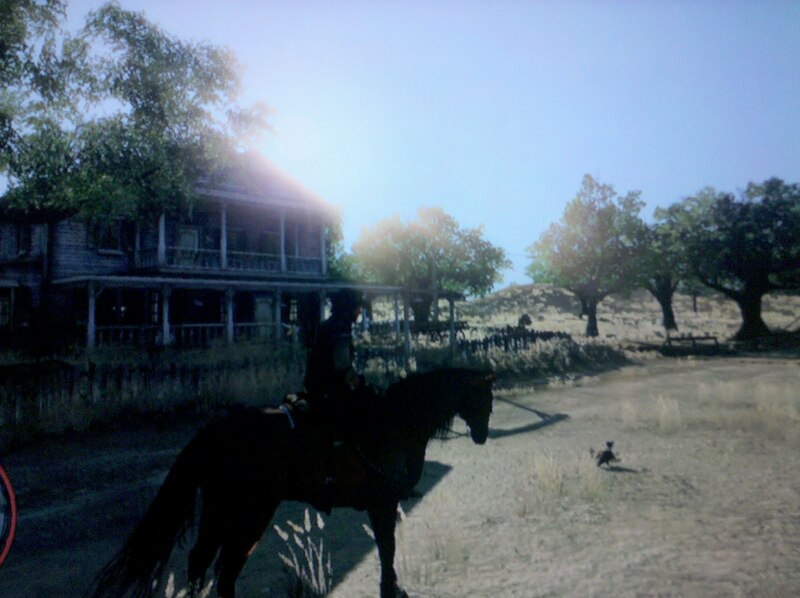 Made good on getting Red Dead Redemption. I decided to go with the PS3 version of the game, for what it is worth. Larry likey the PS3. I like the 360, don't get me wrong. We go way back, me and her. She even traveled down to Texas to get un-red ring-ed. So it might have seemed fitting to get RDR for her. But 'fitting' wasn't what I was going for. HDMI and digital sound was. I'm hooked and I only had it in for a little over an hour. Gamers With Jobs touched on how the tables can turn on hoping to dislike a game today. Not that I stating the game is great based on just playing the first hour. But it can be a funny thing, that first hour. Especially for a game like this one. Lots of questions to be answered. How is the voice acting? Are the committed to the West? How are the controls? Acceptable. On all three questions. That's enough for me, for now. The American West is more then a mythical place. It is a representation of so many things uniquely American. For me it still seems so recent. My dad was born in 1938. My grandfather, born around the time this game takes place, 1911. My great grandfather lived in this world. To me, that is close even if most see it as so far away. There is no question that the game is trying to be GTA IV set in the west. And why shouldn't it. If it can deliver on that then we've got something significant here. As I was checking out the scenery I looked for clues on the commitment from the developers. I wasn't sure what at first, but once playing it becomes clear. Ragged clothing. A voice actor from the mid-west. Hoof prints in the sand and dirt. All there. Sunrises, sunsets. Starry nights. Makes this worn out manufacturing manager a very happy man after one of the roughest days I've had since 2005. That's where the Aberlour comes in. 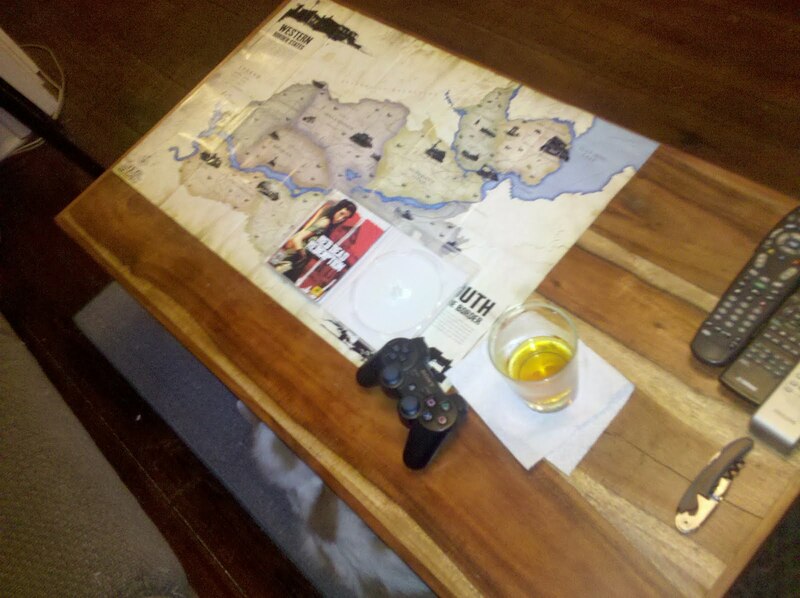 And what's with the picture of my coffee table? That's the familiarity of opening a Rockstar game and getting a big old map, just waiting for you to explore. It's one of those experiences missed by folks just downloading a game or renting it. I know that sounds silly to some, and that's okay. But to me, it's fantastic. Flip it over and you have a poster. Nice artwork that will go far in my review, and something I wish art.com or allposters.com tapped more into. Alas, a quick search on the site yields nothing. Maybe it's just me. Maybe it's just a game. But, ya know, if it hits you right? Man, right place, right time. Looking forward to taking this one in. The above picture is something I took. I could probably find something on the web that is clear or something, but I wanted a shot that was my own, and I just wanted to be there for a while. After today at work... that's all I can ask for.